Over two million people are expected to take part in celebrations to mark Russia Day around the country. The holiday celebrates Russia's sovereignty and in 1991 it was also the day on which the country’s first president was democratically elected. Many festive events are planned throughout the day in Moscow, including a concert on Red Square and fireworks later in the evening. Celebrations have started with the raising of the Russian flag on the top of the Ostankino TV tower – one of the world’s tallest constructions and the first free-standing structure over the height of 500 meters. The flag itself is just as colossal. It is approximately five meters long, and it took some six months to make it. It is now waving more than half a kilometer above ground. More than 90,000 policemen have been drafted in to provide security for events across the nation. 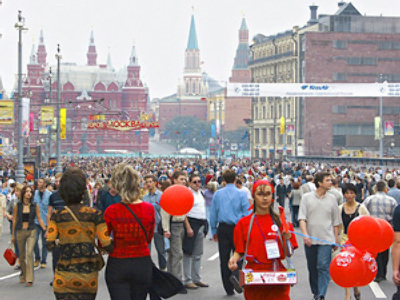 Moscow citizens will have a chance to listen to top performers, touch a two-meter-high “matryoshka” and see a kite performance. Sporting events are also part of the celebration – central Moscow will be host to a drift racing competition for the day. Some of the most experienced drivers both from Russia and abroad have taken part in the competition on the famous Lubyanka Square, located right in front of the former headquarters of the former KGB, while motocross riders showed off some incredible moves, launching themselves into the air and doing stunts. 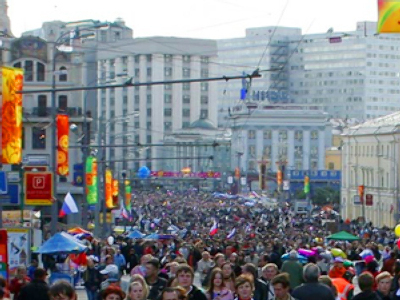 Crowds of people have gathered on Lubyanka Square to watch this breath-taking event, as well as from the balconies of the buildings surrounding it. The same holiday Russia is celebrating today used to be called known under a different name. It was known to ordinary Russians as Independence Day, but no one could really understand what Russia was independent from. Eventually, from 2002 onwards, June 12 is officially called Russia Day, and it is a work-free day for the whole nation. And what could be better to spend it out in the open air? Ten cloud-dispersing aircraft will take to the skies above the capital to ensure the weather stays sunny.